Not a real bunny, but with an imagination...anything is possible. If the Velveteen Rabbit can become real, maybe this one can, too. If you look quickly it looks like a bunny!! Cute photo! Happy WW to you! awww what a precious smile she has! Sweet picture, she looks happy to have found it, even if it's not real! That is really cute! She looks so happy. 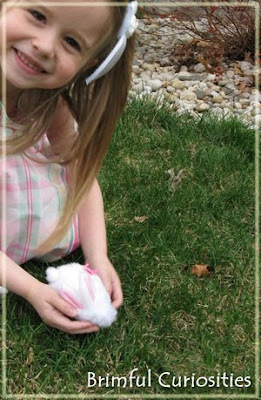 Real or not, she looks very happy with her bunny! :) Very cute! Beautiful shot! I hope you had a wonderful Easter. Oh, I have a feeling that bunny is loved enough already that it's well on it's way to becoming real. That pic is FANATSTIC! She is a doll! That is too sweet! Such a sweet Easter picture! Such a cute shot! My kids got chicks. I took them to school with me, and made them chirp off and on. Everyone was like, "Where's that coming from?" It was me of course.